I ventured into my classroom today with my 2 year old. I actually managed to get quite a bit unpacked and put away with him playing with his cars and trucks and wanting to take out magnadoodles, blocks, markers, books, everything!!! I am excited beyond words to be moving into a bigger classroom. My wheels were turning today as I pictured where I wanted everything to go. Especially my word work center because I just finished wrapping up how it will be organized this year. I am going to print, laminate, and hole punch each task card. They will be held together with a ring. **Sorry, no pictures, haven't had time to put it together with a 2 year old running around**. 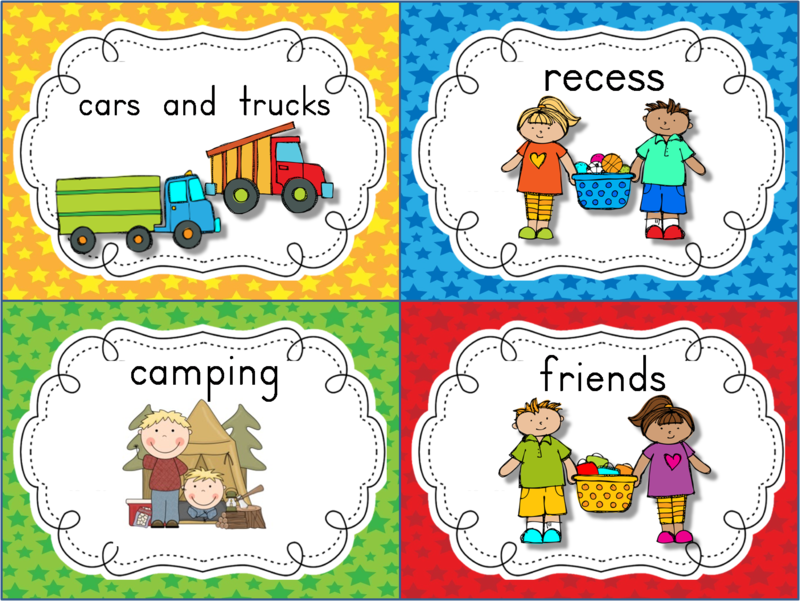 I will create a separate set of task cards for each of my reading groups, based on ability. I plan on spending A LOT of time at the beginning introducing each task card along with expectations. I created recording sheets for some of the task cards. I actually think I will be using a word work journal this year to cut down on some copies. 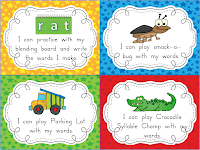 You can check out the task cards and recording sheets, from my TpT store. I would love to hear from you if you download them, along with any suggestions for more activities. Follow my TpT store for more fun stuff to come. What other awesome ideas to you have for word work??? Enjoy! 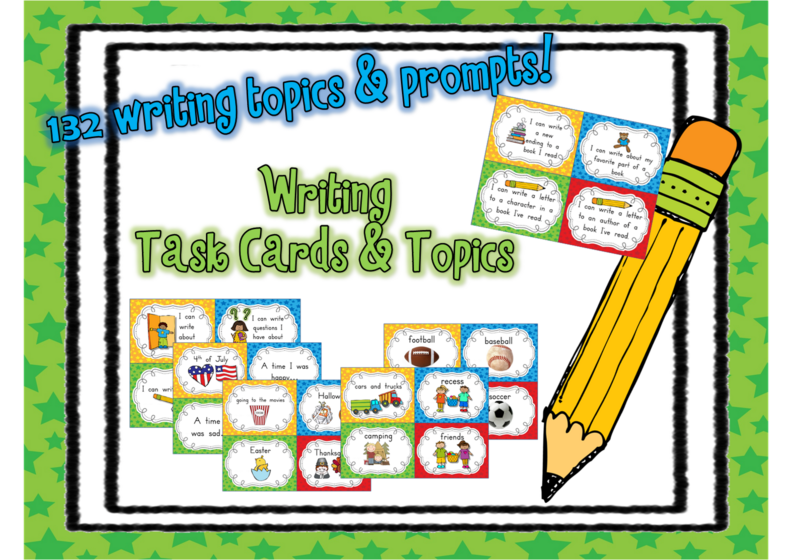 Now posted in my TpT store are Writing Center Task Cards. I wanted the set to be versatile for throughout the year. There are 132 task cards! WHOA!!! Some cards have writing topics on them like a rainy day, a time I was excited, the beach, my family, etc. There are topics for creating lists, recipes, newspapers, poems, and stories. I figured I would just knock them all out at once so I can pick and choose throughout the year. I think they will work great for an anchor chart bulletin board to give kiddos topics to write about, as well as being hole punched and on a ring in the writing center. Check it out in my TpT store! This is wonderful. Thank you! I brought my 18 month old with me to work the other day and he "reorganized" my math manipulatives. Wow! What a total treasure trove of terrific activities! You are very kind to share them. Thank you so much! I found you through Chalk Talk and am your newest follower. Thank you so much for sharing! These look awesome. I also found you through Chalk Talk and am your newest follower. Very cool! WOW! Thank you so much for sharing these wonderful ideas! These turned out great!! I love them! These are fantastic!! Thank you so much for sharing these!! These will work great this year! Thank you for sharing this!! Wonderful!!! These will be awesome! Thanks so much for sharing! These are soooo AWESOME! Thanks for sharing! Oh, wow! It is great to meet another teacher who spends their summer doing school things! :) These are fabulous! You are a gem! WOW, these cards are great! Thank you for sharing! These are amazing. Thank you so much! These are great. Do the colors represent the levels of your students? Also how fo you play the Parking Lot game? Hope this is helpful! I figured what first grade boy wouldn't love an excuse to practice his words and play with cars at the same time!! this is great!!!!!! thanks soooo much for sharing! Do you have something like this made for math stations in your TPT store? Awesome! 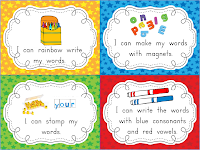 I will be using these in Word Work this year...I wish I could get in my classroom but we aren't ever allowed in until August wish is a big rush. Thanks! These are great choices for word work! These look great! I'm just getting started with The Daily 5, this is just what I was needing! These are great! I just downloaded them and can't wait to revamp my word center for this next year. Awesome, thanks so much!! This is so awesome of you! Thank you! Love this blog! How do you make the backgrounds???? That was the BEST Freebie ever. I have task cards that I have been using, but I will be switching to these. I love how they are stated in a kid friendly Learning Goal--are you doing Marzano? Thanks for the Fabulous Resource. These cards are exactly what I need to make my Word Work Center easier to manage! Thank you for posting them. 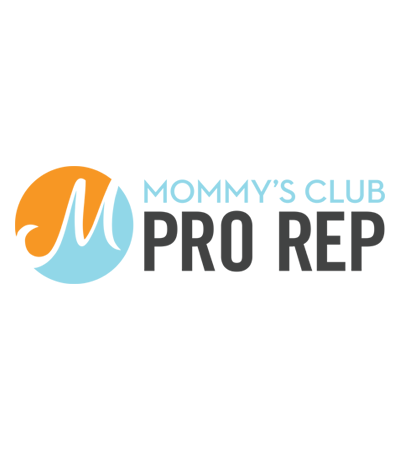 I found you through Pinterest- love your website! These are awesome. Thanks so much for sharing. I found your blog through the your pin. I'm your newest follower. Thanks for such a cute and useful freebie! Hi! I was wondering what program you used to create the cards. I ABSOLUTELY LOVE them! I just found your blog! Love it and thanks for sharing! Thanks so much for your great ideas! I keep looking for more ideas to organize my Daily Five classroom! 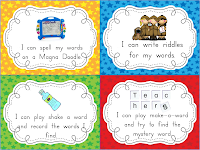 I love those word work cards!! I wanted more things for my writing/lang arts centers and these are great, and so cute! Thank you for sharig! Thank you for sharing these! They will be a great addition to Word Work. You are a gem to make these available for FREE! Thank you so much. I will love using them. I'm determined to get my classroom SOOOOO organized this year! Wow! What an amazing and generous resource!! I will be using these all year long. Thank you so much!! Thank you! Love the colors in the cards. Thank you so much! This will be great for early finishers. Can't wait to use the activities! Thanks for sharing! What font did you use? hi! I would LOVE to have these in my classroom... are they still available as a freebie? if so, how can I get 'em? thanks! I'm learning mandarin Chinese because I believe it's the only way to really learn about China.When I was searching for a place to learn mandarin Chinese, I called several schools. Hanbridge was the best because they had excellent teachers and a very friendly and welcoming spirit . I really appreciate the opportunity to learn here and would recommend Hanbridge to others.